During economic downturns, labour hoarding becomes an attractive human resource strategy if sizeable search and training costs render hiring and training new workers too costly. 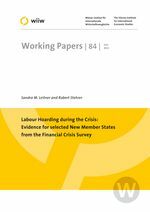 The paper sheds light on the prevalence and extent of labour hoarding in five New EU Member States and Turkey during the global financial crisis, which spread quickly like wildfire after the bankruptcy of Lehman Brothers in September 2008. It applies a unique firm-level panel, constructed by merging the World Bank Financial Crisis Survey (FCS) with the Business Environment and Enterprise Performance survey (BEEPs) and demonstrates that labour hoarding was a widely used strategy among entrepreneurs during the crisis. Furthermore, labour hoarding was particularly frequent among innovators whose substantial R&D-related training costs and extensive search costs for knowledgeable and experienced R&D personnel rendered labour hoarding more cheaply.